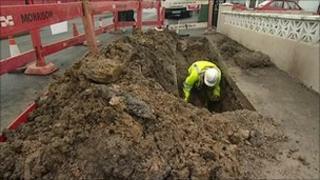 About 3,000 homes and businesses in the Thirsk area were left without water on New Year's Eve after a mains burst. Yorkshire Water said the pipe, which runs to one of its pumping stations, burst at 0230 GMT. Supplies were restored to most of the affected customers, in Carlton Miniott, South Kilvington and Sowerby, by late in the afternoon, the company said. But residents and business premises in Thirsk town centre were not expected to regain supplies until Friday night. Yorkshire Water said it had supplied several pallet-loads of bottled drinking water for residents to collect at four locations in the town; Thirsk Junior School, Thirsk Secondary School, Millgate car park and Tesco car park. Bottled water was also being delivered to vulnerable people in the area. It also warned residents that even when their supplies were back on, they might experience low water pressure for a while. Meanwhile, the company urged local authorities across the region to check pipes at schools and empty buildings, after reports of leaks at 80 schools in North Yorkshire. The company has had thousands of calls about damaged pipes. It said staff were working round the clock to fix them. The firm contacted councils after fears that empty buildings such as schools could be affected. Meter readings have been cancelled so staff are free to help customers. The spokeswoman said the company had bulked up its staff to 300 to cope with the unprecedented number of calls. Richard Sears, from Yorkshire Water, said: "We suspect that there are lots of leaks hidden behind closed doors as businesses have shut for the Christmas period, or homeowners have gone off to visit relatives. "We would urge people to check on their neighbours' properties if they know they're away to see if there are signs of a leak. "If there is, they should contact the owners or Yorkshire Water who will come out and turn the water off. "Similarly, caretakers or landowners should visit unoccupied buildings." The company said it was providing vulnerable customers with bottled water. It added that the reported leaks at the schools had been dealt with.